Imagine you’ve just been given the chance to design your own sports tyre. What features would it have? Race-quality grip? Wet-roads predictability? Touring mileage? How about all three features in one tyre? That’s exactly what Dunlop has achieved in its dynamic new SportSmart. 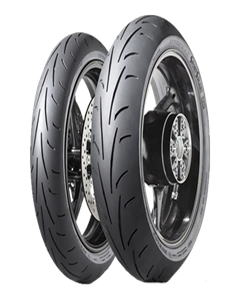 Multi-Tread gives you high mileage and the confidence to push your bike on wet or dry roads, while Dunlop’s unique NTEC system lets you fine-tune the SportSmart’s inflation pressure for totally connected track day performance. For supersport and hypersport riders, the SportSmart is quite simply the tyre you’d design for yourself.